Established by Grant Miller, ServiceMaster of Edmonton now employs over 130 permanent full-time employees ranging from project managers to cleaners, labourers and various trades workers. 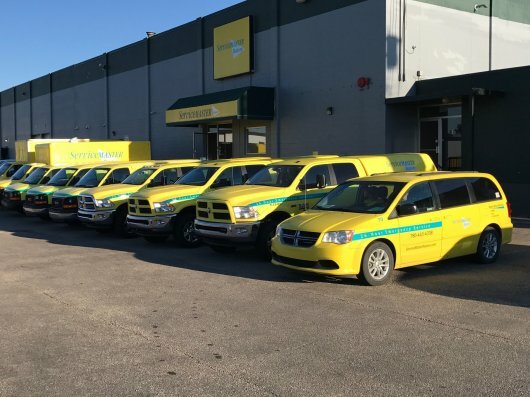 The ServiceMaster of Edmonton fleet has grown from a single cargo van to over 50 fleet vehicles including 4 full-time truck-mounted extractors. ServiceMaster has recently moved to a new facility which houses a cleaning area for clients’ belongings and electronics, contents storage, carpentry workshop, as well as storage space for the company’s equipment. ServiceMaster of Edmonton is compliant with The Institute of Inspection, and Cleaning and Restoration Certification (IICRC) standards. In addition, we are bonded and insured, and have the required WCB coverage. ServiceMaster of Edmonton is ready to respond to reduce the damage caused by fire, flood, smoke, vandalism, etc. We are committed to providing exceptional customer service around-the-clock, 24 hours a day, 7 days a week. No loss is too large or too small to call ServiceMaster of Edmonton! Your customers will be contacted within 30 minutes of the initial call to us. A service team will be on-site within 2 hours to initiate emergency damage mitigation of the property. We will provide a comprehensive estimate for the damaged property within 48 hours or less. And, most importantly, we guarantee the work performed. The job isn't done until the customer is satisfied. We maintain our high standards with constant attention to our Quality Restoration Vendor (QRV) certification process.